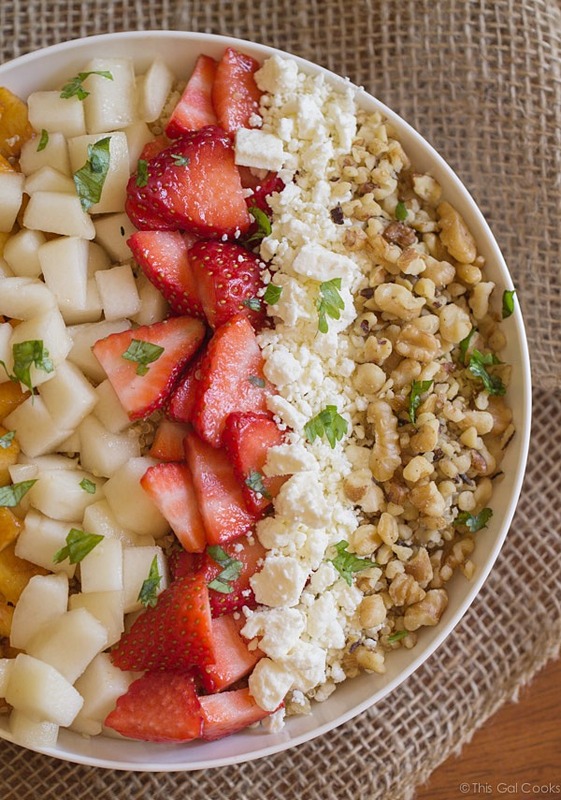 Fluffy quinoa is paired with strawberries, peaches, pears, walnuts, feta and homemade strawberry lime dressing in this Super Fruit and Walnut Quinoa Salad. And then there was quinoa. And fruit. And salad. Pretty much in that order. I always have quinoa in my pantry, so check that item off the list. Then while I was roaming the produce department at the grocery store, I suddenly had visions of fruit salads dancing in my head. I grabbed peaches and pears and strawberries galore. Strolled by the nut station and got those walnuts I so much adore. But wait, there’s one more! Without cilantro I won’t make it out the door. And there you go, my friends. This gal can rhyme too. But seriously, I had this moment in the store; this moment of brainstorming and recipe developing. Right smack dab in the middle of the produce department. Did you know that you can make quinoa in a rice cooker? This gal’s an expert cause that’s how I always make it. It’s easy – I just measure the quinoa out exactly as I would measure rice, dump it into the bowl of the rice cooker, add the same ratio of water to quinoa that I’d would for rice, cover and cook until the rice cooker switches to warm. No need to watch a over a pot. Cause we all know a watched pot never boils, right? Haha, sometimes I feel that way about my printer. I watch it, waiting for it to print but sometimes I think it’s on vacation. This gal I work with once said “a watched printer never prints.” I kinda believe it. I think I must make it nervous or something. Anywho, when you make this salad, you’re gonna want to serve it right away. Peaches and pears get pretty gunky looking after they sit out too long. From my experience, tossing them in lemon or lime juice doesn’t do much to combat the gunky-ness issue if they are going to be sitting out for a while. BUT there is an easy remedy so you can have a make ahead salad: just assemble everything minus the peaches and pears. Chop and add when you’re ready to eat your salad. Or, if you’re a peach and pear super hero and know how to keep them lookin’ purdy for a while, use your method. And please do share. Something awesome about this salad: that dressing right up there. 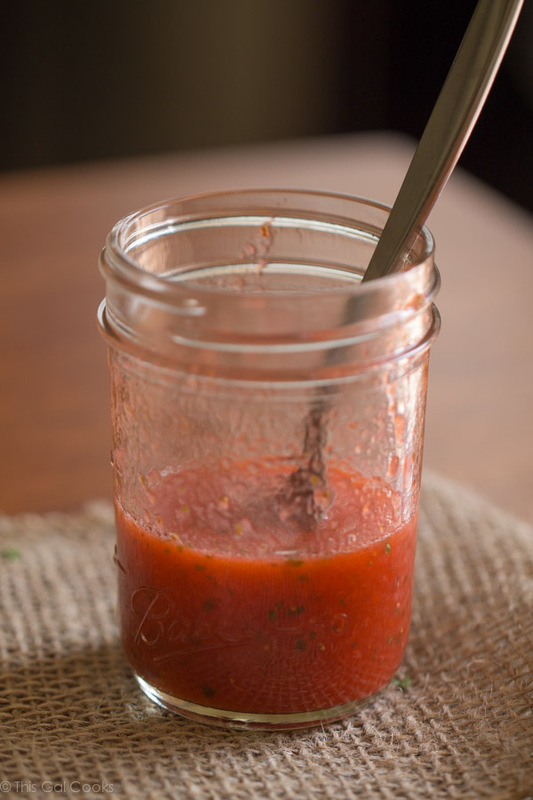 Strawberry Lime Dressing. It’s tangy and a little sweet with the help of some honey. Instead of the usual olive oil, I used coconut oil in this dressing. It’s pretty good. It goes great with this salad and would also pair well with a spinach salad. 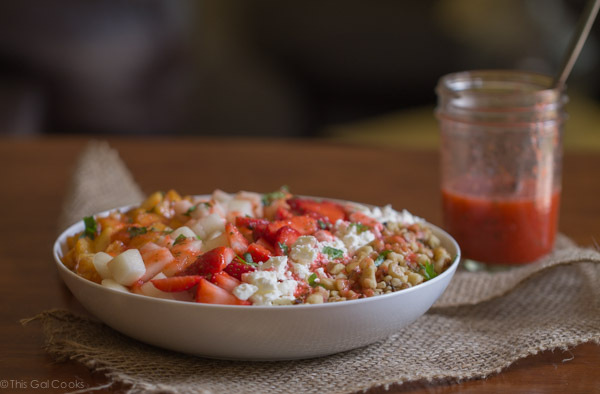 Place the quinoa in a serving bowl or a plate. 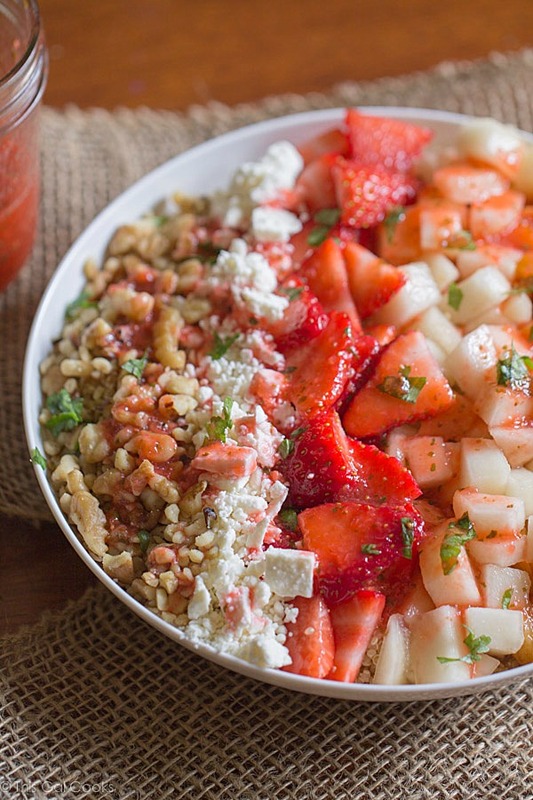 Top with the fruit, walnuts, feta and dressing. Garnish with cilantro. Toss to serve and add more walnuts and feta, if desired. Thank you for the pin and the compliment, Chelsea! This salad looks great, Julie! 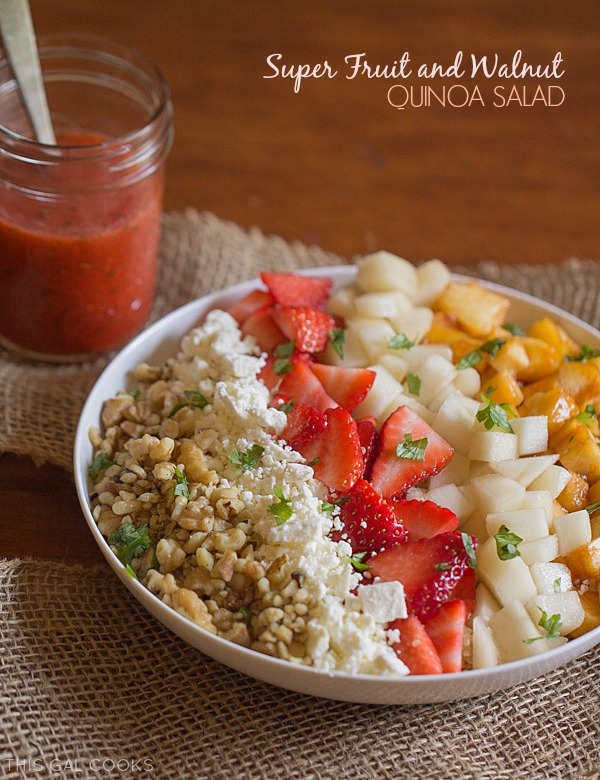 One of my favorites that I have been making a lot lately is a quinoa, strawberry, avocado and mango salad. I love the sweet fruity flavors with quinoa. I’ll have to try this one next time, especially with that strawberry dressing! Thanks, Ashley! I like the sound of that salad that you have been making. I am going to have to try something like that soon! YES! It sure is. It’s perfect for spring. This looks delicious, Julie — sweet, salty, and fresh — perfect for spring! Thank you, Marcie! Definitely a perfect match for a spring day! How bright and fresh for spring! You made a beautiful salad! Julie this looks super delicious! Pinned! Thanks for sharing a hearty healthy salad. Pictures make this salad jump out at me. Julie- This fruit salad looks super delicious! And, I love the addition of the coconut oil. 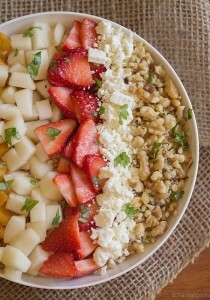 Julie, this salad is stunning and this is something I would love to sit down to! Beautiful! Thanks for sharing and pinning – hope you have a happy Wednesday! Julie, this is brilliant! 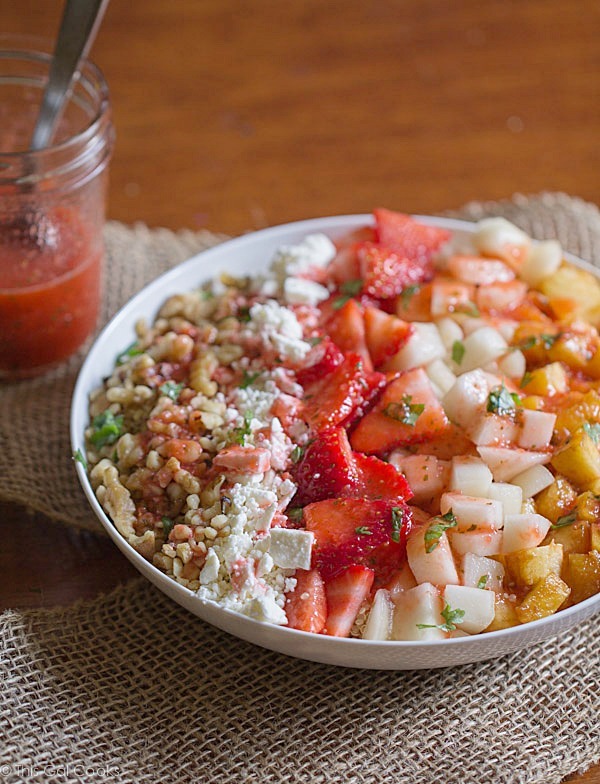 I love the idea of fresh fruit and quinoa. Also, I just got a rice cooker and am now questioning how I lived through my entire adult life without one. Just made steel cut oats in it yesterday and can’t wait to try making quinoa. Great tip! Yes please, I’ll take a big bowl right now for lunch. Great recipe Julie, pinning! Thank you for the pin, Emily!